Handi-Foam and Handi-Seal from Fomo Products now available in 12 oz sizes. Fomo Products has recently released their Handi-Seal Window & Door Sealant and Handi-Foam Fireblock in 12-ounce sizes for smaller jobs. Previously, these products had only been available in 24-oz cans. 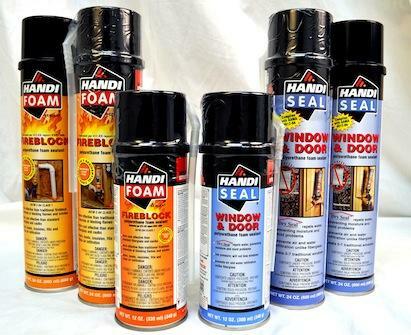 Handi-Seal Window & Door Sealant is Fomo’s patented closed cell, low pressure build window and door foam. The sealants can be applied with a straw applicator, a professional dispensing unit or a professional hose kit (for use with cylinders). Fomo’s Handi-Foam products are designed to seal and fill small cracks, gaps and voids. Handi-Foam Fireblock is used by home builders and remodelers to block the passage of flame and smoke in concealed penetrations from room to room and floor to floor. Fomo Products are available at our Boscawen, NH and Newton, MA locations.